When someone discovered that using tungsten would greatly upgrade a basic non-toxic load's density into something that defied the laws of gravity and speed, just about anyone that had any access to the material got on board and started toward the development of the perfect non-toxic pellet. At the pattern board with American E-Shot. Now, some 10 years on down the road, new ideas are still coming into my sub compact ballistics world in the Black Hills of western South Dakota. This time around, there's a new development that goes by the name E Shot, and it is being offered by Reloading Specialties, based in Pine Island, Minnesota. E-Shot is a tungsten based material with tremendous density, a trace of iron, and tin as a binding agent. What the new shot is not, however, is a hard product on barrels and chokes. E Shot is soft and frangible at very low pressures, and if constricted too far, the pellets seem to just disintegrate cleanly, leaving no trace marks or material in the bore itself. I am basing this observation on a very small sample, but it seems to be a good indicator as to how this new shot type will react when used in high-grade shotguns. To date, I have test fired about 10 pounds as applied to 13â'„ 8-ounce, 48-pellet handloads in a T .20 caliber pellet. Larger shot won't settle like fine shot will, and as a direct result of that, the forces against the containment wad wall can be massive as applied to BB, BBB, T and even F shot when encountered. If you're asking why did this company start with .20 cal T shot, it's because few outfits make it in a tungsten pellet, and, to date, no one makes it in a bore safe shot type. That was until now. E Shot can be made in any pellet size and at any density. This shot as offered for testing retained a density level of .11. My first rounds down range were positive: a Remington Hevi-Shot .54-point constriction choke plastered the target surface with a solid 94-percent pattern that retained a nice distribution of the 48-pellet load. As a second choke, I installed a common lead shot variant because I was searching for any possible damage to it, in this case a Rem Choke tube. At the first shot at 40 yards, the returned pattern count stood at 100-percent in a 30-inch circle, with a solid core density to match. Upon inspection the choke being a .40-point full looked just great. It would seem that E Shot has its own set of rules as to likes and dislikes in choke constrictions and the degree of parallel section employed. Parallel section is the amount of uniform choke diameter the shot column meets as it passes through the choke. In most cases, long parallel distance works best with large pellets, but in this case the standard lead shot full in a Rem Choke, which has almost no parallel section at all was the clear winner in terms of pattern percentage points on paper. I guess that this says never say never, and there are no hard-fast rules of the smooth bore ballistic road being presented here. To be sure the choke game is getting so interesting with E-Shot that this project is just starting to roll. Banded Shot Enviornmetal Inc. was the first outfit to come up with a strange shape for non-toxic pellets. It was at first laughed at by some, but when we started to gain some better understanding as to the net effect of ultra high density shot, the laughter suddenly stopped. Because tungsten is so heavy, you can make a pellet of shot like a cement block if you like and it will most likely still fly in a straight line down range. E Shot has followed the pattern of a different style pellet from the old round ball we all came to know almost at birth if you came from an outdoor hunting and fishing family like mine. 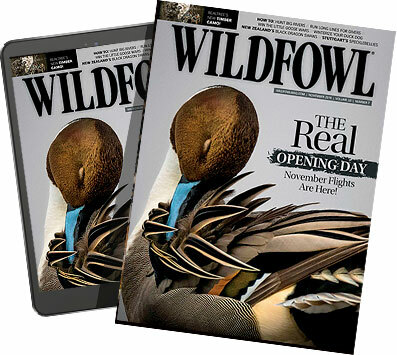 Today, however, because of the increased density of shot over lead pellets, and in some ways just the industry taking a chance of sorts, we are seeing a whole new world of performance from different shaped waterfowl shot. E Shot retains a thick center band on the pellets that is a whole lot like the band on Federal high-density shot. It is caused by the manufacturing process in that E Shot is made by a process not unlike the way drug companies make pills, that is to say one half at a time. If my memory serves me correctly, the Federal high density is made also in two one half step processes. Hence the center band is a bonding point and effect becomes paramount. Shooting this new shot on Perma Gel blocks indicated that it ran a consistent 53â'„4-inch penetration with as many as seven samples measured. This was a 50-yard test and gave clear indications that E-Shot has horsepower to spare. Against wood products as in heavy pattern board backstops I found that 3â'„8-inch exterior plywood would not allow a pellet to be trapped in the material even well out to 50 yards. Shot just went through the wood like a hot knife through butter. This was amazing in that this same shot will crush like sand under the stress of even a soft tap with a small hammer. DESCRIPTION: Unknown soft shot sample. When I ran some down range chronograph work using rifle bullet armor plating in front and around my photo cell screens, I found that pellets crossed the 40 yard mark at 858 f.p.s average when sent out of the 28-inch test gun at 1345 f.p.s. When matched to SHOTdata's computer ballistics the data, which is presented in this review, indicates that E Shot in a T pellet retains deadly killing energy and penetration clear out to 100 yards. Remember for those of you that read this column regularly, 600 f.p.s. (or close to it) is the speed shot needs to be moving. Note the 100-yard figure listed in the ballistics data. One of the best elements associated with E Shot is that it, as its name implies, is American made. Wow, little wonders do take place nowadays. This shot is a remanufactured "green" feral product, so with some luck the price will be a bit lower even as applied to finished factory loads when that process takes place. For now, it is a handloaders product only, but factory loaded ammunition as offered by RSI is not far behind, and most likely here by fall 2008. Getting the shot, or finished loads will require a contact with RSI in Pine Island, Minnesota (507-356-8500). Reloading Specialties, Inc. is also on the net, just search the name. RSI can supply all the reloading data required when getting this new shot up and shooting from your reloading bench. As a side note, be advised that at a time when reloading was starting to sputter just a bit in terms of active numbers of shotshell builders, the hunting level reloading market has rebounded a bit due for the most part to the high price of designer types of non-toxic shotshells. In general you can always reload a given hunting load for about 60-percent of the retail over the counter cost. Keep that in mind if the budget gets a bit thin this year. Also a late word from RSI seems to indicate that it is just possible that this new tungsten based ammunition will be selling a good bit under the current price of some of the other high end 'design' tungsten loads out there today. How much less you're asking? Word has it that it could be reduced as much as a $1 per shotshell. However, be advised friends marketing is not my area of expertise.